So when she announced she would be making a pattern for her clutch bag I was so excited, and jumped at the chance to be a tester! 6 various sized pockets/compartments ideal for holding your cash or I.D cards, lip balm, make up, phone and loose change. As a classic Clutch Bag – use with or without a wrist strap. As a compact Handbag – you can wear across your body or over your shoulder. As a hands free Pouch – wear it around your waist or on your hip. I am so pleased with my finished bag, and I use it all the time when I just need to nip out and don't need my usual 'stuffed full' handbag!! Inside there are some card pockets - these have changed since testing to be long ways - this means you can still slip your cards in, but could also use the pockets for your lip balm or a pack of gum! There is also a zipped pocket where you can safely store your cash and loose change, and an open inner space where you can put odds and ends. On the back of the bag there is a padded pocket with a magnetic fastening - perfect for your mobile phone - this makes it really easy to access - don't you just hate it when you can hear your phone ringing, but by the time you find it buried in the bottom of your bag it has stopped!! There are two eyelets on the bag - one on either side of the flap - this means you can either clip your wrist strap onto whichever side you prefer - or clip your shoulder strap onto both. There is also the option to add little fabric loops instead of the eyelets - great if you don't feel comfortable using metal hardware. The gorgeous clasp on the front is available to buy in the Crimson Cuttlefish Etsy shop - amongst lots of other useful hardware - but you could also use any twist lock you like, or just a magnetic fastening if you prefer. The way this bag comes together is so clever - and it's not only super pretty, it's also really practical and usable with its ample pocket space! 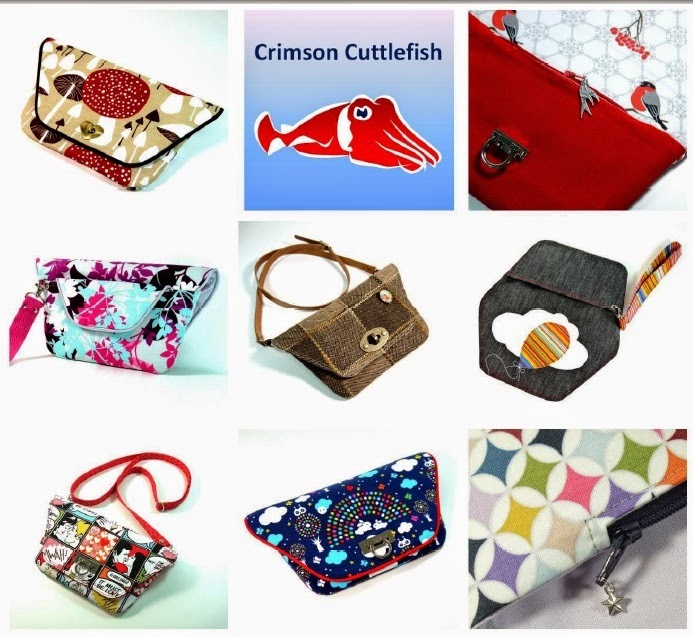 To get your copy of the pattern go HERE and don't forget to stop by the Crimson Cuttlefish Facebook page to check out all the other gorgeous bags!! So impressed with your bag make, I love your fabric choices too! I agree it's a very clever pattern - I loved how this bag came together, like piecing together a jigsaw that miraculously turned into a pretty clutch at the end.